It's always a bumpy road for me but it's mostly because I'm running over children that didn't flee the playground fast enough. Every citizen is entitled to one vote. Just because the population is concentrated where they live shouldn't mean their vote counts less. 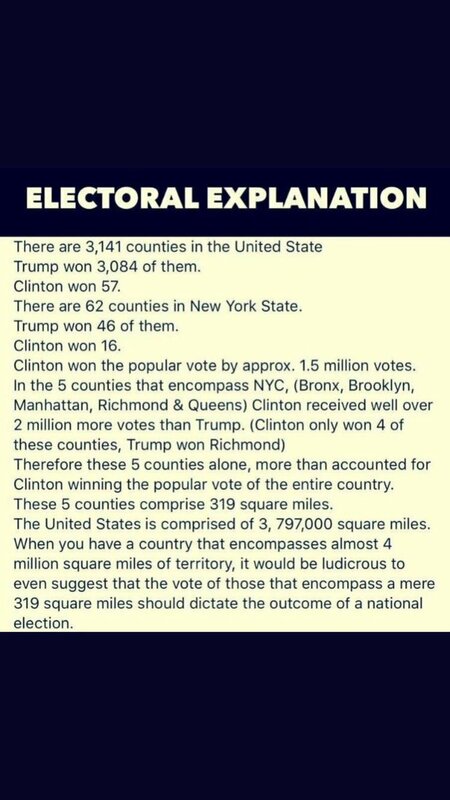 Votes determine how the electoral college votes, unless the chosen goes against the vote, and then they simply become mud, so it rarely happens.. The beauty of it all? If you are in California and feel you aren't properly represented, you can of course feel free to live in Wyoming! In fact that's one of the real miracles about our system. Because a lot of states have vastly different laws, while maintaining free and open borders, people are free to move to states where those laws more aligns with their own, without having to change all the laws in every state. Being forced to move to hicksville in order to have more political say is not just. Several states are practically theocracies or third world countries and there should be zero economic, political, or financial incentive to move to them. Really, they shouldn't even exist. If you want to see a visual representation of why theres an electoral college go search images of the "2016 US election map by county". Keep in mind that this is a depiction of the popular vote at a county level. Despite the fact Hillary won the overall popular vote, this puts into context how the majority of America voted. Without the electoral college, the blue counties would, in most cases, dictate the outcome of the entire state and in some cases the entire US. The Electoral College is a way for rural America to have a voice. I hear you can get a load of acres in Hicksville for the price of a decent car though, I'd be tempted, land in the UK is really expensive. I've seen that map, it's crazy isn't it. It's red all over except for a few counties. thanks - now had 30 min googling " failtless electors "
Lol, I've googled loads from this thread, been really interesting how the system works in the US, and also how US ATS members feel about it. Even Wyoming getting 3 EC votes in a state of only half a million people? I would be troubled with that if I was a US citizen. Well you do not understand we are 50 countries so to speak... So you do not have a problem if England went back into the EU and they gave voting power based on population? Lets say 1 vote per 500k. England would get 132 votes, Germany would get 166 votes, Netherlands would get 35 and a bunch of countries would get 10 to 20 votes. Sound all good to you?